Mary Beth Shaddix feeds her growing curiosity in her colorful kitchen garden and wholesale nursery. After 10 years working in the marketing and research departments at Cooking Light and leading a talented crew at Cottage Living and Coastal Living magazines, Mary Beth left her two Blackberries for, well, blackberries. With a desire to connect her career’s focus of food and media to the outdoors, she turned back to her roots. She began learning the breadth of gardening at a local retail nursery and became certified with the Master Gardeners Association. Little did she know, the manager who curiously eyed her resumé at the garden center would soon be her husband. They now grow together at their wholesale nursery and farm, Maple Valley Nursery, near Birmingham, Alabama. 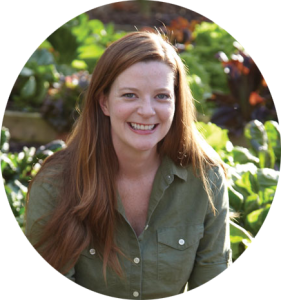 Her work can be seen in Cooking Light, Southern Living, HGTV, Garden & Gun, on national retailer sites, and on retail shelves. Her first book, The Cooking Light Pick Fresh Cookbook, launched nationwide April 2013. She is also the founder/owner of A New Leaf Consulting, helping national consumer brands tell their stories.